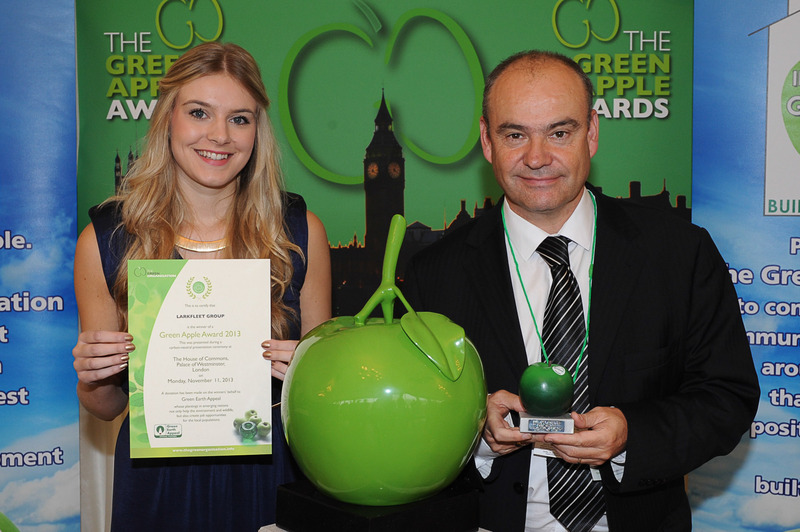 Larkfleet Group chief executive Karl Hick with his company’s Green Apple Award. Lincolnshire housebuilder and developer Larkfleet Group has won a national industry award for its sustainable building practices. The company’s Larkfleet PassiveHouse project won a silver accolade in the ‘energy reduction’ sector of the prestigious national Green Apple Awards. Larkfleet PassiveHouse, constructed by Larkfleet next to its headquarters in Bourne in Lincolnshire, is a prototype house, designed and constructed using lightweight materials and off-site construction techniques which could revolutionise the construction industry. The successful completion of the Larkfleet PassiveHouse proves the technical feasibility of materials and techniques that have the potential to reduce costs, time and carbon emissions in building construction. Researched, designed and constructed by Larkfleet as part of a consortium of companies, it is the first house of its type with the potential for mass production and widespread use across the UK. Larkfleet competed against more than 500 other nominations and chief executive Karl Hick was presented with the Green Apple Award at a glittering presentation ceremony at the House of Commons. “This award success demonstrates just how Larkfleet Group is committed to investing in the future of the construction industry,” said Karl. As a result of this success, Larkfleet has been invited to have its winning award submission published in The Green Book, the leading international work of reference on environmental best practice, so that others around the world can follow its example and learn from its experience. Larkfleet will also be considered to represent the UK in the European Business Awards for the Environment. The Green Apple Awards have become established as the country’s major recognition for environmental endeavour among companies, councils, communities and countries. This entry was posted in Lifestyle and places, New homes - events, News and tagged Green Apple Awards, Karl Hick, Larkfleet, Larkfleet Group, sustainable building, The Green Book. Bookmark the permalink.